Special Powers also creates/gives workshops, which of course have a little extra: they help you develop your Special Powers! These workshops are also very suitable for the classroom. For this workshop, the children are asked to create a “Recipe for a happy me”. The idea came from the book I wrote “Do you even know how wonderful you are?”. I included a similar question in the bonus-part of this book, where kids can write, draw and add their own content. The idea is to make a recipe, that says what you need, how much of it and how often, in order to be happy. What brings you joy? Making such a recipe is fun and important, but also very nice and interesting to talk to your parents about. For parents it’s a positive and practical conversation-starter about the child’s needs. The nice thing about it is that it makes clear that everybody has needs and that that’s okay. It’s good to know what you can do to make yourself happy. 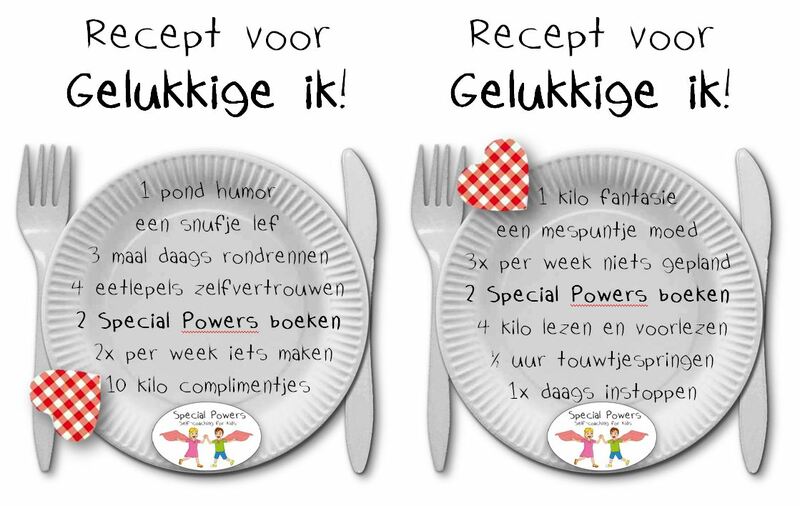 Encourage the child to include at least a few needs in their recipe that they can fulfill on their own, to empower them and make them feel less dependent on others. It’s also a nice idea for the classroom. Have the children write their verse on a piece of colored paper and hang it on a long clothesline with clothespins. This way, you can create a wonderfull wavy wealth of wishes :-)! This workshop is inspired by the book I wrote ‘Monsters bestaan niet!’ (‘Monsters don’t exist!’). It’s a delicious workshop, because you are going to make your own pizzacake. 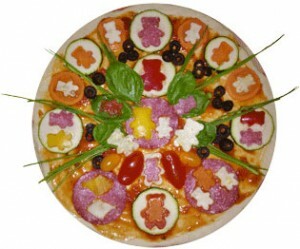 It’s a pizza, decorated like a cake, but made with only savory ingredients. First you make the dough, spread some sauce on it and then decorate it with vegetables in as many lovely colours you can think of and maybe some meat and cheese. To make fun shapes, you can use cookie-cutters. That way, it’s going to be a party on your plate! Yummy and healthy! The trick is discovering that partyfood or fun food can also be made of healthy things, when you explore the art of decorating :-)!